Meet location and post codes will be sent as part of the confirmation email. If there is a venue where the event is 'SOLD OUT' or the number of tickets available is not enough for your group then please contact us or see our Last Minute Tickets page for available last minute offers. Charlton House in Greenwich, London was built between 1607 and 1612 by Sir Adam Newton, Charlton House is one of the finest examples of Jacobean domestic architecture in the country. 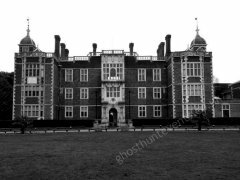 The house and grounds were used as a hospital for officers during World War I and were bought by the Metropolitan Borough of Greenwich in 1925. The North (Chapel) Wing was bombed during the Blitz of the Second World War and was subsequently rebuilt albeit with non-matching bricks such as were available in the immediate post-war period. Minimum Guest Age: 18 years old. Read previous customer Feedback/Testimonials from this location. 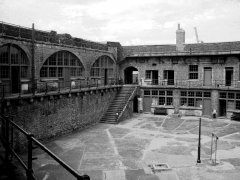 Landguard Fort was built just outside Felixstowe, Suffolk, at the mouth of the River Orwell, Landguard Fort was designed to guard the entrance to Harwich. The first fortifications from 1540 were a few earthworks and blockhouse, but it was James I of England who ordered the construction of a square fort with bulwarks at each corner. In 1667 the Dutch landed a force of 1500 men on Felixstowe beach and advanced on the fort, but were repulsed by a garrison of 400 musketeers of the Duke of York & Albany's Maritime Regiment (the first English Marines) and 100 artillerymen with 54 cannon. 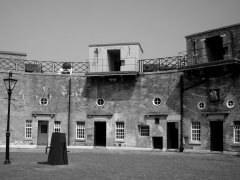 The fort was considered part of Essex in the 18th and 19th centuries; births and deaths within the garrison were recorded as 'Landguard Fort, Essex'. A new Fort battery was built in 1717, and a complete new fort on an adjoining site was started in 1745 to a pentagonal bastioned trace. New batteries were built in the 1750s and 1780, but the biggest change was in the 1870s where the interior barracks were rebuilt to a keep-like design, the river frontage was rebuilt with a new casemated battery covered by a very unusual caponier with a quarter sphere bomb proof nose. Several open bastions were enclosed, and a mock ravelin block constructed to house a submarine mining contingent. The 10inch gun pit in Left Battery was converted into a Anti-aircraft Operations Room for Harwich in 1939. Visitors as well as local people, have their own experiences of paranormal activity in or around the Fort. The most common being the image of a sailor looking out of the top right window (the side visible from the road). Most reportings were in the 1990s, but occasionally there are still reports of lights at night and being "pushed" whilst visiting the top floors. Building work commenced in 1864, with a workforce of 250 men and three steam engines. Work was completed in the summer of 1871 and the guns were emplaced in 1873. The fort was originally armed on the eastern side in the 1870s with two 9-inch rifled muzzle-loading guns on Moncrieff disappearing carriages, the only such arrangement in the UK. From about 1906 the armament consisted of two modern 6-inch Mark VII breechloading naval guns, and two modern light QF 12-pounder guns for defence against torpedo boats. The main 6-inch Mark VII guns were replaced in 1941 by a battery of BL 6-inch Mk 24 coastal guns (a modern coast defence version of the Mark VII built during World War II), which were located west of the fort. The army vacated the fort in 1962. Restoration began in 1982 following a failed commercial redevelopment venture, and 6-inch Mk VII guns have been re-installed in the fort to approximate the 1906 - 1941 armament. 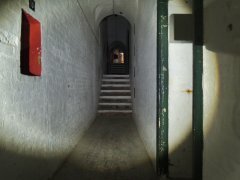 There are numerous reports from visitors to the Fort, when walking into the main tunnels, or the caponier, of being pushed and seeing dark figures slipping into the shadows. Other reports include sounds and smells, people have reported the noises of chains clinking. Some believe it is the ghost of a woman called Martha who committed suicide at the fort. Other occurrences happen in the magazines and laboratory. The forts numerous exhibitions are also a hot bed of activity. People have reported hearing the sounds of soldiers boots, footsteps and shuffling, moans of suffering have also been heard and reported on numerous occasions. Harwich Redoubt Fort in Harwich, Essex was constructed between 1808 and 1810 to protect the port of Harwich against the threat of Napoleonic invasion. The fort was constructed on a hill, which allowed views in all directions. French prisoners of war were made to help construct the fort. The fort has a central parade ground. It was originally armed with ten 24 pounder cannons. In 1861 a 68 pounder cannon was added to the fort's weapon range. Later in 1903 three 12 pounder QF guns were added to the fort. Despite the ongoing modernisation no shot was fired in force. In the 1920s the redoubt was falling into disrepair. The fort was briefly used during the Second World War to house British troops awaiting trial. Restoration started in 1969 and still continues today. Witnesses have reportedly seen apparitions through the windows and heard unexplained footsteps. Many visitors to the fort have also reported being touched by unseen hands in the lower casements. There have also been many other mysterious noises and apparitions seen by visitors. The fort is well known for the apparition of a headless soldier. In 1972 a soldier was decapitated by a cable attached to a 12 ton cannon which broke under the strain. It is rumoured that this soldier now roams the fort. 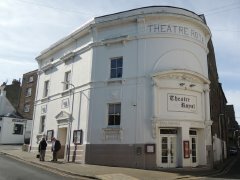 The Theatre Royal, Margate, Kent is the oldest theatre in Kent and the second oldest theatre in England. The Theatre Royal was built in 1787, burned down in 1829 and was remodelled in 1879. The exterior is largely from the l9th century and has remained relatively untouched. From 1885 to 1899 actor-manager Sarah Thorne ran a school for acting at the Theatre Royal which is widely regarded as Britain's first formal drama school. Actors who received their initial theatrical training there include Harley Granville-Barker, Evelyn Millard, Louis Calvert, George Thorne, Janet Achurch, Adelaide Neilson and Irene and Violet Vanbrugh, among others. According to local reports, hauntings began in 1918 when the ghost of Sarah Thorne (an actress) was seen. There is one particular area where paranormal activity is higher; a trapdoor which leads to what was a smugglers cave. Paranormal activity has been reported on the stage and backstage and it is known that one of the boxes is haunted as a man jumped from the box to his death during a performance. Another ghost, that of an actor who committed suicide, is held responsible for creating strange lights that float around the stage area. The D Day Tunnels (Underground World War Two Command Centre) in Portsmouth, Hampshire has about 1.5 miles of linked tunnels directly beneath Fort Southwick and they were excavated by the Royal Engineers in 1942. 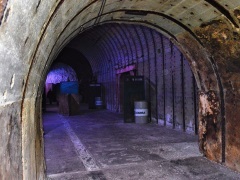 These tunnels provided a bombproof, comprehensive Operation Control Centre. The tunnels housed approximately 700 staff working on the Combined Operations Headquarters and the co-ordination of various military operations including the now famous "Operation Overlord" the codename for the D-Day Normandy Landings by Allied troops during the Second World War. Reports from radar stations were crossed-referenced with messages from shipping to provide an accurate picture of what was happening in the English Channel. This information was then plotted on a large table map in the map room of the tunnel. Some of the functions of this Underground Command Centre were duplicated at the Bunker underneath Dover Castle. After the war the tunnels ceased operations in 1949 then reopened again by the Royal Navy during the 1956 Suez Crisis when it was refurbished, they were used again in the early 1960s during the Cold War as the Defence Teleprinter Network of the NATO Communication Organisation and as a Communications Centre "COMMCEN" for the Royal Navy. During this time the Soviet Union identified Fort Southwick as a "Category A" target and consequently it was a main target for the Russians. The Command Centre Bunker remained in use right up until 1974. During the history of the tunnels, deaths have been reported at this secret and important location. Many of the tunnel linings have been removed over the years exposing the original chalk walls, which gives the tunnels its eerie sensations. The existence of the D Day Tunnels (Underground Second World War Command Centre) and its D-Day and Cold War connections was a closely guarded secret. The entrance to these tunnels are very uninteresting and unimposing. 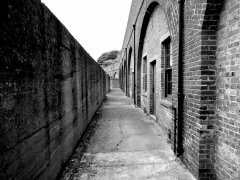 Distant chilling screams are often heard as well as Spirit voices and strange aromas smelt in various parts of the tunnels. The Brook Red Lion Hotel in Colchester, Essex is a historical Grade I listed building dating back to 1465. 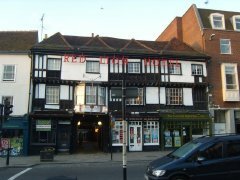 Located in the busy town centre of Colchester, Britain's oldest recorded town, The Brook Red Lion Hotel in Colchester is one of the oldest inns in the area. The Parliament Restaurant at the Red Lion Hotel was once the old Banqueting Hall, still showing its timbered beams. There are three known ghosts - a small boy that can be seen in the Parliament restaurant occassionally and has appeared in a guest's photograph, a ghostly monk that hangs around in reception, but the most active is Alice Millar. Alice was a chambermaid at the hotel and was killed by a lover. Alice has regularly been heard whispering and even talking to staff. There are recent accounts of people's hair being pulled and a womans voice appearing on a video taken in one of the rooms, with no obvious cause. The original rooms still have their original wattle and daub beams. They are also, obviously, the most haunted. Fort Burgoyne in Dover, Kent was originally known as Castle Hill Fort. Work started in 1861 and it was complete in 1868 as one of the Palmerston forts surrounding the South of England. It was built to a polygonal system with detached eastern and western redoubts with a surrounding ditch, flanked by three demi-caponniers and a double caponnier to the North. Two detached wing batteries to the East and West of the main fort were also constructed in spurs off the main ditch. The main fort comprised a large parade ground, to the North of which was a long row of casemates, which provided the barrack accommodation for soldiers and officers. Above the casemates, on the terreplein, were Haxo Casemates, which housed the guns. This was to guard the high ground northeast of the strategic port of Dover, just north of Dover Castle. The fort is named after the 19th century General John Fox Burgoyne. After the First World War Fort Burgoyne was used as military depot or store for Connaught Barracks. Until recently the central part of the fort was still owned by the Ministry of Defence, forming part of the Connaught Barracks site. There were two mysterious deaths in February 1887, two men died for no known reason. Ghost Hunt Events can organise your Private overnight ghost hunt for your group. The maximum number of people will be determined by the venue. Ghost Hunt Events will organise an unforgetable night which you'll be talking about long after the ghost hunt. You will go to a haunted location for an overnight ghost hunt. Spend a night in a haunted Castle or Mansion? You watched the TV shows, now experience a real ghost hunt for yourself.